Hanoi Train Station has many alternate names – Tran Quy Cap, Hang Co or Le Duan Train Station (since this place use to be grass selling area for horse). It was established in 1902 by the French Colonial, originally to serve the French Government in transporting coal and other minerals to Haiphong port, and from there to deliver to France. After 1945, the station became the place to transfer soldiers to the South. In 1976, Hanoi Train Station was rebuilt the last time and now become one of the most important stations of Vietnam Railway System. Now it has 2 areas: Area A (located on Le Duan street) is for the Thong Nhat railways, from Hanoi to Ho Chi Minh city. Area B (located on Tran Quy Cap street) is for others railways (to North highlands, for example). Nowadays the station are modernized and upgraded with free Wifi, and railroad infrastructure sees frequent maintenance services. Hue Train Station lays on the straight railways from Hanoi to Ho Chi Minh City, built by the French Colonials in 1906 to transfer goods from the South to the North, and vice versa. This is a historical place, where patriots used to connect together through the secret areas around the station. In 1945, the station earned the name Tran Cao Van station, and from that time to 1975, the Station has carried thousands of young people to the South to fight for the Liberation. 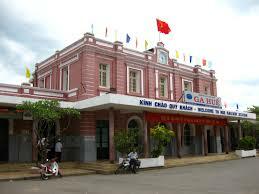 Nowadays Hue Train Station, based on Bui Thi Xuan Street, is one of important station of the country, a big transit point of the Center of Vietnam. 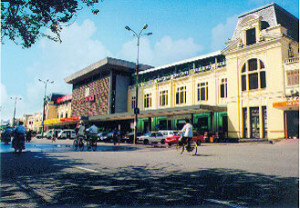 Ho Chi Minh City Train Station is located in District 3, the most crucial economic and social center in the South of Vietnam. 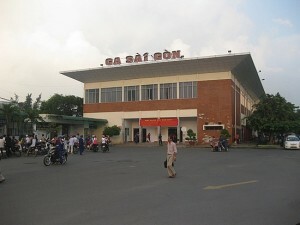 Its location makes this place an important node in the North –South railways system of Vietnam. The station serves more than a million passengers and thousands tons of goods annually, and this number is expected to increase rapidly in the foreseeable future. Back to the past, this station has been built on the base of the former Hoa Hung train station since 1978 after the North and South of Vietnam had been integrated. The construction of the new Saigon train station lasted for 5 years until 1983, an after that, this train station has become the main hub for train in the area that serves both people and goods. At present, Ga Saigon (Ho Chi Minh’s train station) is also the most modern train station in the South of Vietnam, with high quality facility and well equipped waiting room. These services do not only aim to satisfy the passengers, but also reflect the accelerative development of Vietnam’s railways industry.